Steve Bannon testified Tuesday in front of the House intelligence committee for more than 10 hours and reportedly gave very few answers. Lawmakers on the House intelligence committee aren't very happy with former White House chief strategist Steve Bannon. That's because he reportedly gave very few answers when he testified behind closed doors with committee members for more than 10 hours Tuesday. 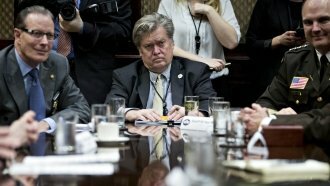 Lawmakers told Politico the White House ordered Bannon not to talk about his time working on the Trump transition team and in the West Wing. In a rare bipartistan effort, the committee issued Bannon a subpoena on the spot to compel him to talk, but the White House reportedly still ordered Bannon not to answer questions. Rep. Adam Schiff told reporters, "This was effectively a gag order by the White House." White House press secretary Sarah Sanders wouldn't say if the White House gave Bannon instructions on what types of questions he shouldn't answer. "We've been cooperating fully with these ongoing investigations and encourage the committees to work with us to find an appropriate accommodation in order to ensure Congress obtains information necessary to its legitimate interests,” Sanders said. Bannon didn't invoke executive privilege, but Rep. Tom Rooney said the House intelligence committee would respect it if he did. But it's unclear if executive privilege applies to happenings before President Donald Trump took office. The panel might ask Bannon to testify again, but regardless, one committee member told reporters, "We're going to get the answers from Mr. Bannon that we did not get today."